The Boston Public Library is the first public library in the United States and a national landmark. It has a great collection of books, informative exhibitions, and stunning architecture. It really makes for the perfect introduction to the city. Pro Tip: A well known secret is that it also has one of the best teahouses in the city, but get reservations in advance! Want to fantasize about living in a Venetian mansion with some of the greatest art in the world or learn about the most famous art heist in history? The Isabella Stewart Gardner Museum is an eclectic Boston staple. It’s so unique, you’ll have to stop by and see for yourself! Pro Tip: The best picture is from the third floor balcony at the open window. It’s an amazing view! Go visit the incredible ICA Boston which boasts an impressive collection of modern art! Sitting on the harbor, the views are almost as stunning as the artwork. While you are there try out their mobile engagement app to dive deeper into the collection! Pro Tip: Check out the Friday night “Pop Up Talk” series, which are 15-minute conversations in front of works of art for a truly unique tour experience. Want to know what an immersive, 360 video was like in 1935? Or maybe you want to travel the world without leaving Back Bay? Go to the Mapparium, in the Mary Baker Eddy Library, to have a short break from the conference in a beautiful three-story-tall marvel with amazing stained glass windows. Pro Tip: Need to have a meeting during your trip? With natural acoustics on either end of the dome, the space becomes a whispering room. Be sure to cover all the Boston bases! Fenway Park is a home run, with tours everyday from 11-4pm! As the first baseball stadium built for the MLB and the home of the Red Sox, Fenway boasts the famous “Green Monster” a long green wall that makes it easier for right handed batters to score a home run. Pro Tip: Not a big baseball fan? Fenway Park also has great concerts to check out! Hidden in plain sight in a deceiving convenience store in Back Bay, Bodega is a one of a kind apparel shop. Known for street/skate style and their famous sneakers, stop by this secret store and grab yourself some new kicks. Pro Tip: Look like a local and walk all the way to the back of the store to the Snapple Machine! The Cambridge Graffiti Wall is at the epicenter of culture in Central Square. It is constantly being updated and there is usually music from buskers happening all around. Pro Tip: Go at night! There are plenty of great bars nearby to grab a drink. Spyce is the world’s first restaurant with a robotic kitchen! Just as amazing as it sounds, this technologically-powered spot was developed by MIT mechanical engineering graduates who have taken fast dining to the next level! At Spyce, you are able to order from an electric kiosk, with vegetarian, vegan, and gluten-free options, after you select your dish, the robots get to work on cooking your food in under three minutes. Stop by and check it out for yourself! 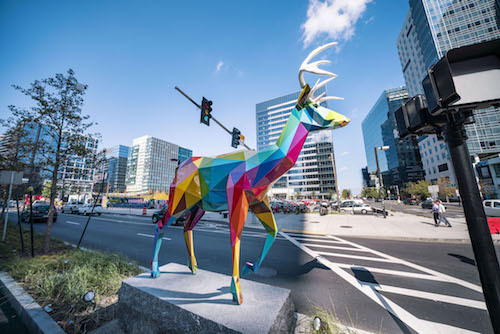 Contemporary Spanish artist, Okuda San Miguel’s beautiful sculpture work perfectly enhances Boston’s Seaport. His 8- to 12- foot sculptures line Seaport Boulevard, making exploring the city by foot that much more enjoyable! Each sculpture is labeled with artist information, but if you want to learn even more check out Seaport’s web mobile app, made in partnership with Cuseum! P.S. Before we leave you, if you’re looking for great food, head to the South End and nosh at The Gallows, Toro, Myers+Chang, Frenchie, or Kava Neo-Taverna. Headed to MW19 and want to grab a coffee or come to our office during the conference? Give us a shout!